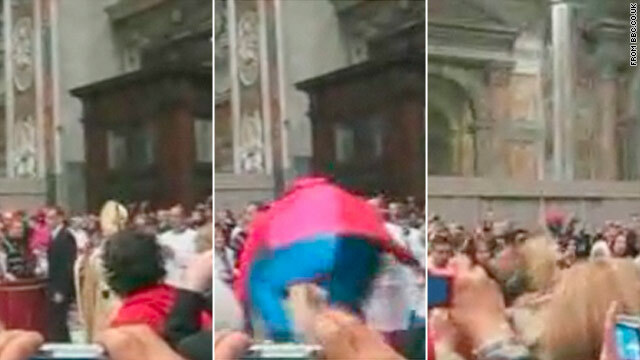 (CNN) -- A woman jumped a barrier at the start of Christmas Eve Mass at St. Peter's Basilica and knocked down the pope, briefly disrupting ceremonies. Screams erupted from onlooking worshippers when the woman ran toward Pope Benedict XVI and grabbed onto his vestments as he walked down the main aisle of the church, video footage showed. He was quickly helped to his feet by his aides -- prompting cheers from the crowd -- and the service was resumed, Vatican spokesman Federico Lombardi told CNN. The woman was removed by Vatican guards, Lombardi said. "As compared to say, the president of the United States, the security membrane around the pope is pretty thin and fairly permeable," he said, citing similar past incidents, including one that happened last Christmas Eve. Allen said that generally, these disruptions are caused by people who aren't seeking real harm, but who want to be close to the pope. Benedict began what has traditionally been a midnight Mass at the Vatican at 10 p.m. as officials sought to keep the 82-year-old pontiff from a late night. Celebrants in Bethlehem, the traditional birthplace of Jesus in the West Bank, however, joined the Latin Patriarch Fouad Twal for a midnight Mass attended by Palestinian Authority President Mahmoud Abbas and other Palestinian officials. Outside the Church of the Nativity, erected over the site Christian tradition says was the place of Jesus' birth, the faithful gathered under the watchful eyes of heavily armed Palestinian police. But Palestinian shopkeeper Nadia Hazboun said the security situation in the West Bank has improved in the time since the militant Hamas group took over Gaza and Abbas' Fatah movement abandoned the narrow strip of land between Israel and the Mediterranean for the West Bank. Christmas Eve in Bethlehem is a popular destination for American Christians, including Iowan Paul Edelman. "Just the festivities, the idea that this is the birthplace of Christ, and you get to see all the historic places and share it with people from around the world; it's a very nice experience," he told Voice of America radio.